When seventeen-year-old Jory Pike can’t shake the hellish nightmares of her parent’s deaths, she turns to an old family heirloom, a dream catcher. Even though she’s half blood Chippewa, Jory thinks old Indian lore is so yesterday, but she’s willing to give it a try. However, the dream catcher has had its fill of nightmares from an ancient and violent past. 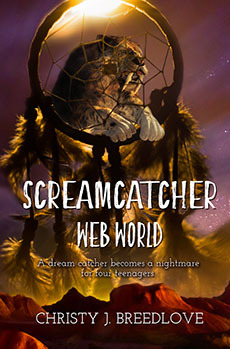 After a sleepover party, and during one of Jory’s most horrific dream episodes, the dream catcher implodes, sucking Jory and her three friends into its own world of trapped nightmares. They’re in an alternate universe—locked inside of an insane web world. How can they find the center of the web, where all good things are allowed to pass? I'm late! Jorlene Pike swung the front door open and leaped out of her apartment only to collide with a body. Their faces met with a hard clack, doubling her over in pain. Her purse slipped from her shoulder and hit the porch deck. She bent to pick it up; the other figure also crouched and fumbled for it. She knew right then it was Choice Daniels. Another unexpected visit. I’d like to make time right now, but I can’t. “Jethus, Choice, if you were any closer to my door...” she picked up the purse and threw her arm into the strap “...you would hass been made of wood.” Her jaw hurt. She had some trouble forming words. “Were you trying to thspy on me through the peephole?” She took quick inventory of her teeth with her tongue—all were there, but her chewing gum was missing. She had no desire to straddle the saddle on his motorcycle at this time in the morning when the streets were wet. She’d been on the back of it before and it wasn’t too bad, her arms clasped tightly around his hard body—the scent of his neck, when pressing her face into it. There you go again. Marching past him, she headed for her Jeep Cherokee at the curb. As she dug in her purse for her keys, Choice’s plodding steps followed her. She hesitated for a beat then continued on to the driver’s door of the Cherokee. Before she could stick the key in the door, Choice had his hand on the handle. He pulled it a couple of times. Now he’s putting on the chivalry act. Of course, the door wouldn’t open. She waggled the keys at him and arched an eyebrow. “There's nothing to think about,” she said, unlocking the door. She ignored the question as she stepped in and shut the door. A twist of the ignition key and the car hummed to life. She looked back at him. Choice stood in the middle of the street, a look of abandonment plastered across his face. He looked pathetic, like a stray cat peeking up from the bottom of a cardboard box. It wasn’t that he didn’t pass in the looks department. He had a hunky body and a chiseled face, but he also had a fourteen-year-old mind hardwired into an eighteen-year-old body. And when it came to chasing after Jorlene “Jory” Pike—as he had for the last three years—Choice sorely lacked in the dignity department, much less the romance department where he had no more finesse than a tornado hurtling through a trailer park. She unlocked the passenger door. After he fastened his seatbelt, she threw the car into drive and flicked on the wipers. Out of the corner of her eye, she watched him study every item in her car—the candy wrappers in the center console, the crack in the dash panel, the small disco globe swinging from the rearview mirror. It wasn’t the first time he’d been in her Jeep, but he always noticed those little things. On other occasions, he’d used them as conversation pieces, just to start a dialogue. He was sweet and endearing at times, but he could wear on her nerves. Yeah right. Time was sure having a hard time healing the sudden death of her parents. It had been thirty-four days and twelve hours since her parents’ car took a too-wide turn on Cloud’s Reach Pass and plummeted over the cliff edge. It had made no difference that her dad had been trying to get home for an anniversary party that he and Jory’s mother had planned for months. They’d never made it. Jory screwed up her face, thinking about it. “It’s like a really good film that got mixed up in the editing department at some studio,” she said. “Everything. It's like somebody cut out a really sweet section of the story and put in a horror scene.” She sniffled and then blinked back a tear. Jesus, here I go again. Albert Pike’s White Feather Novelty Store was a single-story log cabin building that sat on a quarter acre flanked by multiple-story glass office buildings. It gave the impression that the store had been shoe-horned onto the property. Red geraniums planted in antique horse troughs sat on the long porch, while red and yellow wagon wheels leaned against rickety porch beams. They arrived in front of the store and Jory parked at the curb. She locked the Jeep and strode up to the double-glass front doors, primping in her reflection before she swung one open for Choice, letting him take the lead. Once inside, she passed through a swinging door to step behind a glass display counter that stretched from the front of the shop to the rear. After stashing her purse inside a small cupboard behind the counter, she looked around for her grandfather. Her gaze fell on her unplanned guest. You are so sweet, but insufferable. Choice stood with his feet bolted to the main aisle where he had stopped, awestruck. Much of the inventory consisted of Native American tourist brick-a-brac—toys, apparel, books, posters, blankets, boots and moccasins. A small tack wall, holding some saddles, took up the rear corner of the shop. Hygiene items, camera film, medicines, snack food, tanning lotion and maps occupied the first aisle at the front of the store. Moving toward the rear of the shop, items got progressively older and more Indian in nature and craftsmanship. Dozens of quart and gallon jars of multicolored sand sat in neat rows supported by pine shelves. Potions and herbs took up small niches. All of the jewelry and semi-precious stones sat in neat rows inside the floor-mounted glass counters. She couldn't guess what Choice was thinking as his eyes panned back and forth, taking in all the sights. She’d seen it all dozens of times and never told him of its existence. She didn’t need a stalker at work. Choice walked off toward the rear of the shop, his focus pegged on an archery and slingshot rack. Jory heard the faint noise of a toilet flushing in the back room. A moment later, Albert White Feather Pike stepped out into the counter aisle. His small, black eyes caught sight of Jory, prompting him to rush to her, which was still slow motion. She adored the way his arms and legs would scissor in sync, making him look like a tiny windup soldier. She met him halfway—as she had done for the past six months—and put her arms around him in a gentle embrace. Her chin rested on the wispy snow-white hair atop his head. Her grandfather always opened the shop for her, sometimes very early in the morning. He would read and wait for her arrival, like an expectant child waiting for a surprise toy. Since her parents had died, his need to be with her had intensified. Although he never mentioned the subject of her parents passing, he always waited for her to express any pains or emotions about it. He had a good ear and wise advice. “He’s not exactly a boyfriend,” said Jory. “Just a friend.” She felt awkward saying it. “Hmmm…you are black, you hang, and you are Irish,” said Albert. “That must be a good thing, and we could talk about that all day. But to other matters...” He took Jory’s hand and pulled her down the counter aisle until they arrived at a large, black velvet board screwed to the wall. Two dozen webbed hoops hung on tiny hooks, their bottom portions trailing feathers and stringed beads. Some of the hoops were circular, while others had teardrop-shapes. Of course, Jory knew that these were the dream catchers, and was familiar with some of the tribal legends associated with each variation. Albert pointed to the board and began to explain. Choice, who had followed them, sidled up to the counter to listen. “The big spider was the teacher, then?” asked Choice. Jory rolled her eyes, having heard the legend before. “You’ve got the real deal then,” said Choice, his eyes roaming over the board until he looked up toward the ceiling and saw an enormous dream catcher hanging from a rafter. Jory had seen it before. It was as large as a basketball hoop, trailing long, elegant feathers. But it appeared that it hadn’t been cleaned or dusted, which gave it a brittle, antique appearance. It looked like thick strings of gut or leather had been used to fashion the web. A few talons and claws hung from individual strands, a marked difference from the construction of the others. “Where did that one come from?” asked Choice, indicating the large catcher with the flick of his eyes. She felt like she was being tag-teamed. It was true that both of them had her best interests at heart, but what would she gain by sleeping under a flimsy tourist charm designed to trap nightmares? This was the twenty-first century—not the Black Hills a hundred and fifty years ago. Yet she felt she could at least compromise. “I suppose so,” she said and extended her hand to take the dream catcher. Jory watched, awestruck as Choice hiked up his leg and slid over the counter, landing next to her grandfather. Her grandfather seemed neither surprised nor angered by the display. The two walked to the backroom and disappeared behind the door. A latch fastened. She had a feeling that whatever those two were up to was bound to have her reaching for Tums or aspirin for the rest of the day.